My childhood memories of Christmas are wonderful – Santa, toys and family. As I got older, though, I realised that Mum spend an inordinate amount of time in the kitchen. Sweating. Perspiring. So when I was handed the Christmas reigns last year, I decided to make an abrupt departure from traditional fare and the Keeping Christmas Merry Menu was born. little tastes of food – a kind of Christmas tapas menu. lots of little jobs that can be delegated – I’ve found there’s always lots of willing helpers around, but unless I’m organised I can’t really make the best use of them. cooking on the BBQ and using the smoker. Because I can’t stand the heat in the kitchen – boomtish! Salt and Pepper Prawns with Lemongrass Mayonnaise. BBQ these bad boys! The great news? It worked! Everyone was happy to do a little job and I didn’t spend the day sweating it out in the kitchen and missing out on the frivolity! So for your Christmas cooking pleasure I give you the Keeping Christmas Merry Menu…..
Sides: Bok choy with oyster sauce and fried crispy garlic & rice. Oysters served a few ways: natural, Japanese, kilpatrick, thai with mango & pomegranate or grilled with garlic crumbs. 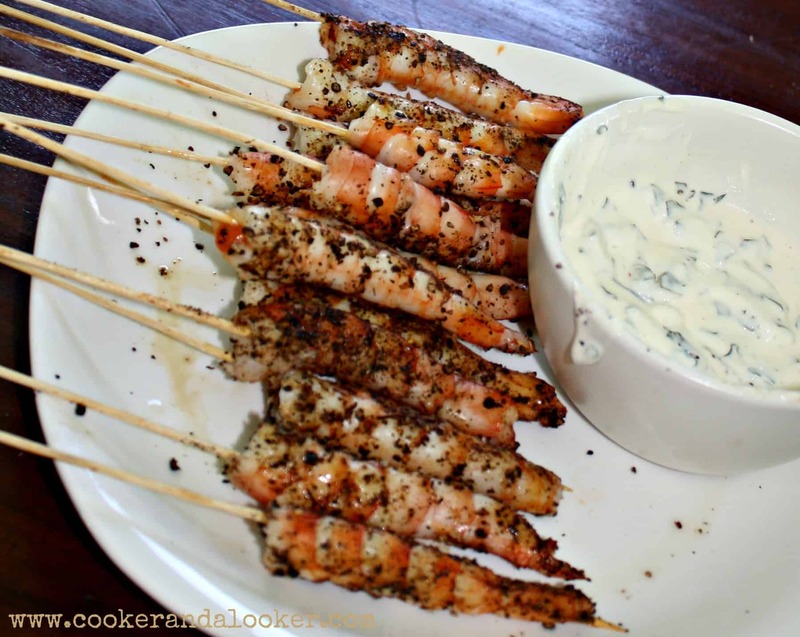 Salt and pepper prawns with Lemon grass Mayonnaise. Smoked salmon with salade folle. Peachester Gold ham – you can order this directly from the Barry Family Butchers. Ask for Nathan – he’s gorgeous! Raspberry, Mang0 and Macadamia Vacherin. 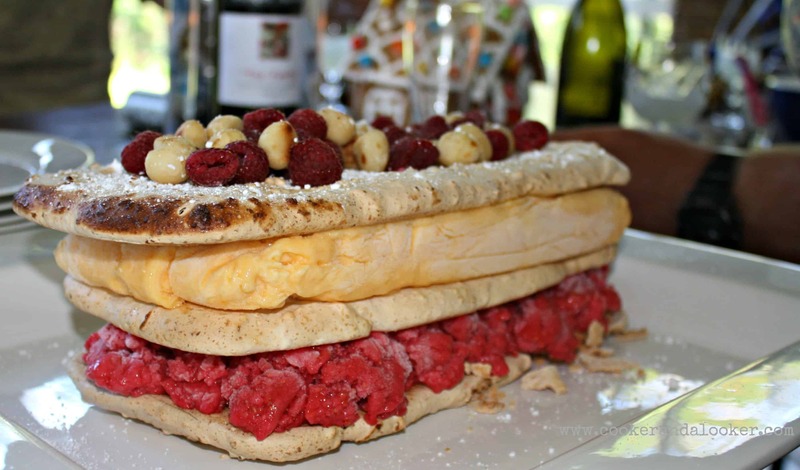 Raspberry, Mango and Macadamia Vacherin – our new Christmas tradition. It’s so refreshing! Keen for a tasty Christmas that’s fun for everyone? I’ll be sharing all the recipes you need over the next few weeks. Subscribe by email and they’ll be delivered neatly to your inbox. In the meantime, have you got any Christmas tips? How do you stay organised? What an awesome Christmas Lunch! We do a very simple lunch. Everyone brings something. We sit down about October and start planning. Usually it’s a Chicken salad platter, sliced cold ham and turkey roll. Plus either a potato bake or potato salad, watermelon salad and a rice salad. Trifle and fresh fruit salad and pavlova (nests this year) for dessert. We don’t have a huge amount of people to feed though. Just us 5, plus my mum, sister, step son and his girlfriend this year. If there are more people then we add in a couple of extra salads and add a bit of extra meat. We also have lots of basic nibbles and some traditional family fave baked goods, like apricot balls, crown mint slice and hedghog. Your christmas fare sounds wonderful. That dessert looks bloody beautiful!! I’d be gatecrashing just for a slice of that!! Alicia, the vacherin is a beauty. The mango and raspberry are so fresh – it’s a great way to finish Christmas lunch without wishing you’d worn elastic waisted pants! Oh yes I’ll be back for several of these recipes. Yum yum!